Cameron and Tyler Winklevoss, the 6-foot-five-inch, Olympic-rowing twins who remain best known for their legal battles with Facebook CEO Mark Zuckerberg, could have taken the money they were eventually awarded in the case (a reported $65 million shared with partner Divya Narendra) and hit the beach. They decided to become full-time investors instead. In fact, since 2013, they’ve been assembling startup stakes across numerous industries. The brothers, who live both in L.A. and New York, have grown especially bullish on Bitcoin, creating among the single largest portfolios of the digital currency. To better understand why they’re so convinced that Bitcoin is here to stay — despite a rough 2014 — we asked Tyler to explain their thinking. Sure. 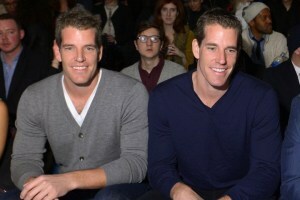 Over the last two years, Cameron and I have been focused on building Winklevoss Capital. Prior to this, we were elite athletes for close to 15 years. After retiring in 2012, we decided we wanted to get back into the startup game and investing seemed like a natural entry point. For the past two-plus years we been spending a lot of time building a strong network of fellow investors and promising entrepreneurs. We’ve been fine-tuning our filters to what we like and don’t like, and developing our overall investment thesis. Most importantly, we’ve been investing a lot. Ourportfolio now comprises more than 40 companies and is growing by the day. You’re both active on AngelList. How do you plan to use your own fund and AngelList to your advantage? Are you thinking of angles beyond just crowd-based syndication? We recently launched the Winklevoss Capital Syndicate on AngelList and have already begun syndicating our first deal. We think the crowdfunding venture model has a lot of merit and we have been devoting significant time and effort towards getting behind it. When possible, our plan is to syndicate the deals that are appropriate and give accredited investors access to these deals. Our current portfolio demonstrates the types of deals we do, and investors who back our syndicate ahead of time will get priority. It’s important to note that backing does not obligate an investors to invest in any of our deals. I still think there is ample room to improve crowd-based syndication before focusing on other alternatives. Currently, closing takes days waiting on every wire and ACH transfer to hit. Incorporating Bitcoin into the AngelList platform for instance, would allow settlement to happen immediately. In addition, there is a lot of territory to be explored with regard to smart contracts in this context. Investors could invest contingent on certain fundraising targets being met, and the real-time balance of a syndicate would be completely transparent if it lived on the blockchain. Investors worried about momentum could instead invest immediately, knowing that if certain goals weren’t met, their money would be sent back. This particular example could help mitigate a chicken-and-egg funding dilemma and tip some startups into getting funded that otherwise wouldn’t. But the possibilities don’t end there. Any conceivable investment term could be baked into a syndicate smart contract and be triggered when certain milestones were met. Pro-rata pre-emptive rights, super pro-rata pre-emptive rights, sliding scale discount rates, information rights, etc., could be hard-wired, all the way to the election of a board member by vote of the syndicate investors. It is going to be fascinating to see this play out. You’re both big Bitcoin believers, but 2014 was a tougher year. As early-stage investors and with only a few larger firms investing (or conflicted out), how do you help your seeded companies thrive during a time where the area isn’t as hot as it was in 2013? 2014 had its own set of challenges for Bitcoin, but as the saying goes, what doesn’t kill you makes you stronger. I think Bitcoin will finish the year more robust than ever. I say this taking into account a lot of metrics beyond just a surface measure of price. Price is just one indicator of strength, and there is evidence to show that the price highs at of the end of last year were more noise than signal (as a result of Mt. Gox trading bot manipulation), and should not be used as a benchmark. A more complete measure of strength should include the number of 10xers and tier-one venture capitalists who have moved into the space. It should also include growth in the number of Bitcoin startups, the amount of accelerators, incubators and hackathons that are Bitcoin-focused, and the sheer lines of Bitcoin-related code that have been written. All of these numbers have grown dramatically this year. Bitcoin may have lost some of its novelty buzz, but today it lives in meaningful business and technology headlines more than ever. Let’s not forget that less than a year ago the majority of media stories were busy lampooning Bitcoin as a ponzi scheme and/or a safe haven for money laundering that was on the brink of being outlawed. Now, serious Bitcoin news and developments are reported by the minute in the most respected and well-read publications and blogs around the world. If some of the frenzy has ceded to a calmer, more earnest narrative, then I think that is a positive development. The growth curve of venture capital Bitcoin investments over the last few years has been steep and up and to the right. Provided that there isn’t a major economic downturn, I believe the venture capital money flowing into the space will be plenty to fuel continued growth. Some have brought up a potential funding gap with respect to core development. I think that is a more relevant concern, but again, there are a lot of projects and non-profits tackling this. This year, both federal and state lawmakers have time and again decided not to outlaw Bitcoin but rather embrace it as an extremely transformative and monumental technology. This sets the stage for some great possibilities for this year and beyond.